Happy new year to all! As we head into 2016 we thought we would have a little look back at all the Make, Do and spend activities over the last year…..
All best wishes for 2016! Despite the unseasonably warm weather and a distinct lack of festive knitwear, the last few weeks have been all about getting into the festive spirit. From homemade Christmas decorations to festive baking, with a generous amount of seasonal celebrations and family gatherings thrown in. It’s been an incredibly busy few weeks. So it was a surprise to find the final weekend before Christmas has bought with it some welcome down time. Rather than the last minute present wrapping, card writing and Secret Santa shopping that usually precedes Christmas day, this weekend’s change in pace has allowed time for wholesome activities such as wreath making and mince pie baking, and of course the opportunity for an extremely overdue blog post! I’m enjoying the calm. My job is changing/evolving in the new year so this Christmas feels different, full of new opportunities and possibilities, i’m excited to see what the new year will bring. This recipe has become something of a tradition over the past few years, somehow it’s not really Christmas until the first Amaretto hot Chocolate of the season has been sampled! This one is definitely for the chocolate connoisseur as it’s intensely chocolatey and the amaretto adds just a little sweetness. I recommend using the best chocolate you can find, with at least 70% cocoa solids for a seriously bitter sweet drinking experience. This is my idea of the perfect hot chocolate, Amaretto being one of my favourite liqueurs, but if it isn’t for you feel free to experiment with the flavours here. For a vegan option why not try Almond milk instead of milk and cream, for a no alcohol version try adding a cardamom pod when heating the milk and whisk in a couple of tablespoons of maple syrup for sweetness. The recipe makes two mugs of hot chocolate. Warm the milk and cream together in a saucepan until almost boiling. Whilst this is heating up, finely chop/grate the chocolate. Once the milk and cream mix starts to simmer remove from the heat and whisk in the chocolate until melted and well combined, by whisking you should get a lovely light, frothy mixture. Finally stir through the amaretto. Pour into mugs and serve with toppings of your choice, I opted for cocoa nibs, meringues and just a sprinkling of cocoa powder. Marshmallows and whipped cream are always a winning combination too! Wishing all our Make, Do and Spend friends a very merry Christmas, and a happy 2016! This week saw the return of The Great British Bake Off to our TV screens, it’s one of my very few must watch programmes and i’m very excited to be tuning in every wednesday over the next few weeks to watch the competition unfold. It was great to see the series kick off with some magnificent cakes, (And some less so!) its also a hot topic of conversation amongst my foodie friends, so strangely enough all this baking got me thinking about not baking. We live on the Narborough rd in Leicester, Aka “the Narb” to us locals where one can pretty much acquire anything your heart desires, it’s entirely possible to exist solely on the offerings of the Narbourgh rd, should you want to. I’ve spotted quite a few enormous watermelons on my weekend strolls and decided that this was to be the weekend to purchase the largest watermelon I could find. 10kg to be precise. In a blue plastic bag Down the Narbourough rd, it wasn’t terribly glamorous but my head was spinning with ideas of what to make. 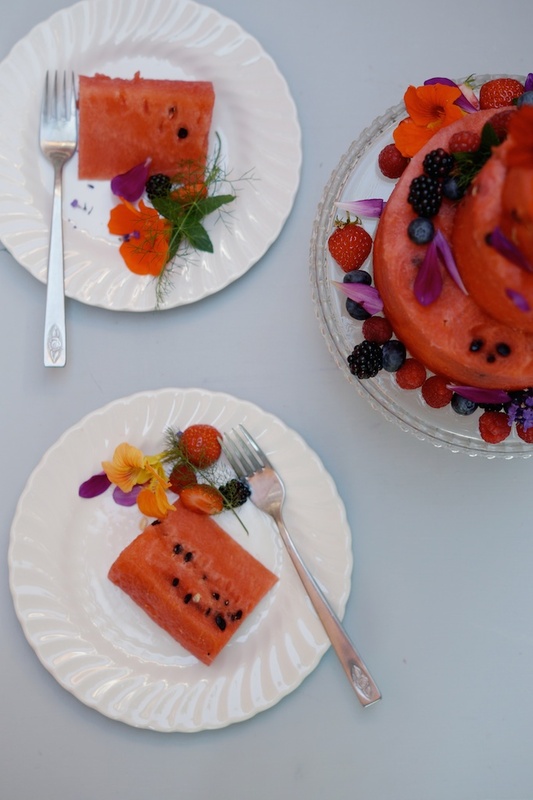 Watermelon vodka is always a winner at adult BBQs but I was tempted to try something a little different and created this refreshing three tier watermelon cake instead. 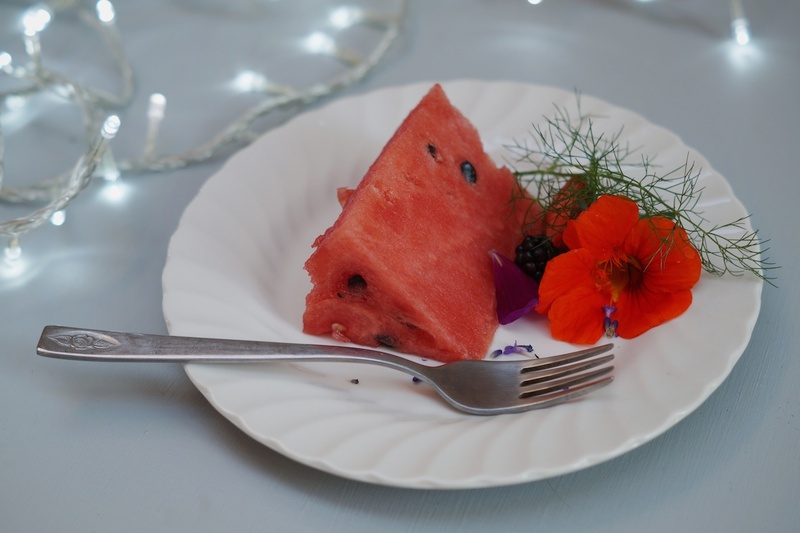 The good news is watermelon cakes are pretty simple to make, all you really need is a good sharp knife. Here follows an explanation of how to achieve this for next time you have an enormous watermelon handy. There are many virtuous qualities to this cake also. It’s vegan, refined sugar free, gluten free, nut free so no need to feel guilty about diving in! 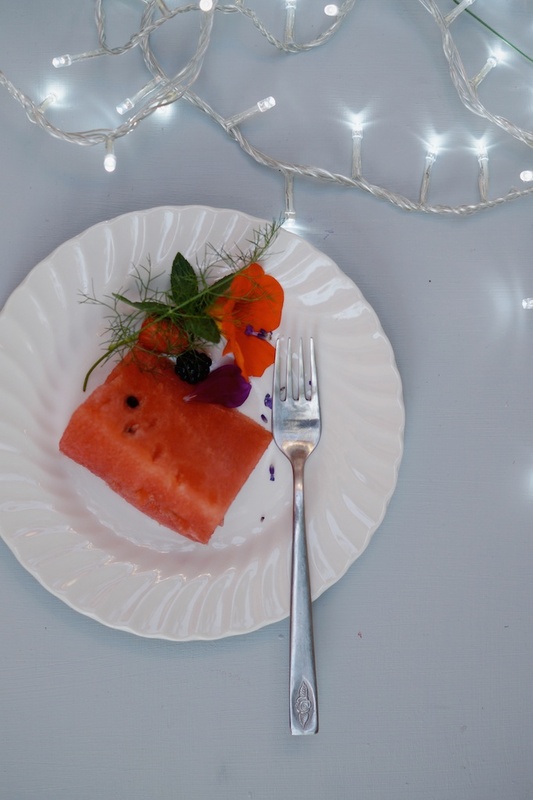 Slice your watermelon across the middle into 3 even slices to create the three tiers. Cut circles out of the flesh inside the watermelon, for this I used bottomless cake rings, 8″ for the base, 6″ for the middle and 4″ for the top tier. once you have the three tiers cut you can sharpen up any edges or straighten the tops of each tier if necessary so each layer stacks evenly. That being said, if the cakes are a little wonky this adds a little drama so don’t worry too much! Stack the layers on top of each other. No dowels needed as the watermelon itself is pretty sturdy. 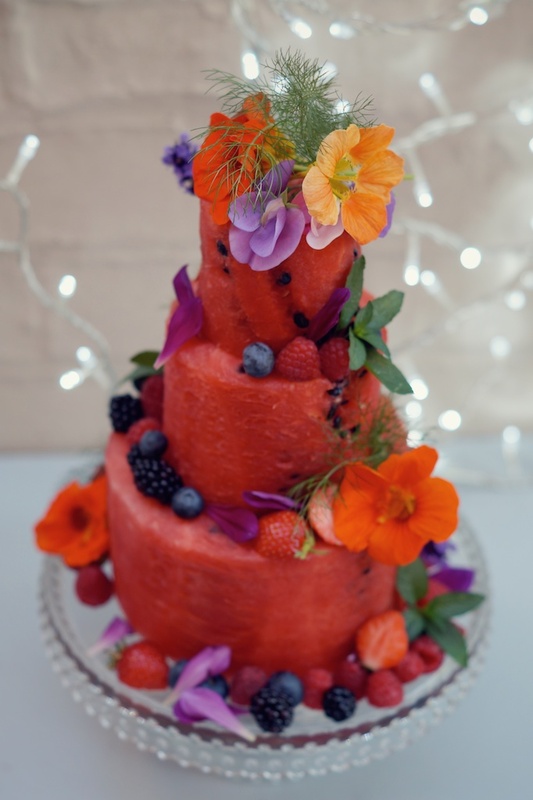 Once stacked, it’s time for the fun bit, get creative and decorate your watermelon cake with fresh fruit and berries and if you have any to hand edible flowers work a treat. 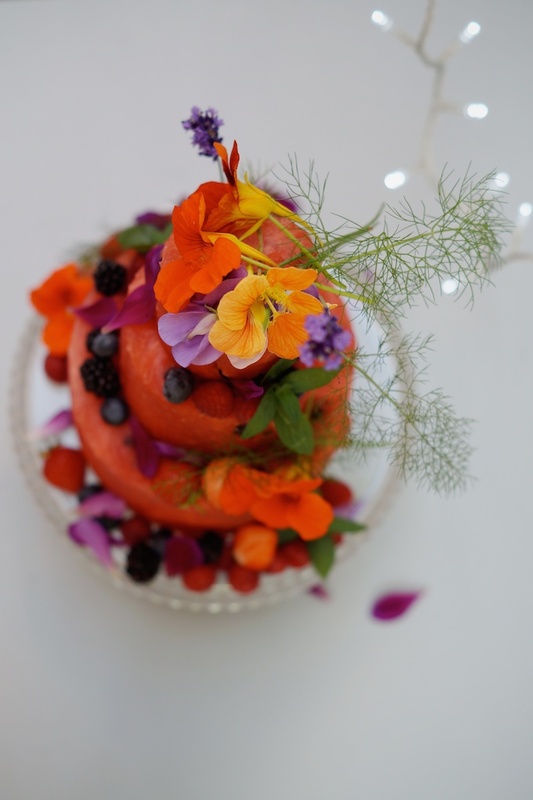 Here i’ve used nasturtium, lavender, sweet peas, fennel and dahlia petals so the cake is entirely edible. 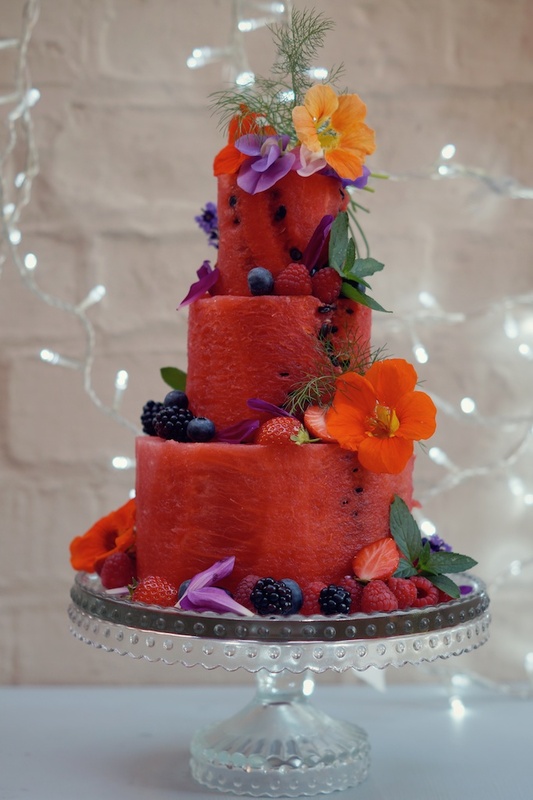 So next time you fee like baking consider this colourful, refreshing and above all healthy option, and of course you could also douse the cake with vodka too if you wanted to liven things up a bit!